Design Effective Custom Functional Test Fixtures for Industry - EMC Technologies Inc.
Certain industries require custom functional test solutions to meet their unique needs and requirements. Mobile test station and universal test station options can provide flexibility and cost-effective opportunities to maximize a return on investment for custom functional test fixtures. 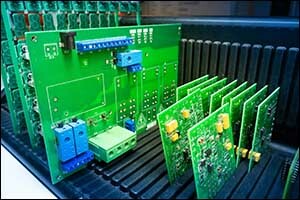 At EMC Technologies, we design and manufacture discretely wired and wireless functional test fixtures that are used for performance verification of printed circuit boards (PCBs) and electronic assemblies. We work with a variety of commercial applications to meet the demands of clients working within many different industries. Some of the industries that we have worked with extensively include military and defense, aerospace, computer services, medical, networking, telecommunications, and satellite TV/IP, as well as consumer electronics. We have developed highly customized interface test adapters (ITAs) to support military and subcontracted military programs. Our wide range of unique client industries and custom functional test demands have helped us to stay current with the latest testing strategies and solutions. We are extremely proficient in the areas of high speed, tight tolerance, temperature, test racks, and RF test fixtures. Some of the work that we have done for clients in the data and telecommunications industries include test solutions that are highly flexible and allow for easy adaptation for high-volume testing. These clients will also frequently ask for solutions that range from simple to complicated testing options to provide the opportunity to adjust and scale testing applications based on technology changes and ever-evolving needs. Universal test station options allow for precise testing solutions while providing the means to expand capabilities according to the client’s needs to reduce costs associated with testing of similar product types and configurations. Clients who come from the medical device manufacturing and semiconductor industries will have testing demands that include rigorous validation and acceptance for their suppliers, according to industry demands or their own internal requirements. One way to meet test, time, and cost constraints is to develop hardware and software at the same time. For many of our clients, the advantages associated with using a mobile test station are clear, offering designed-in fast access to all inside resources with expansion areas that feature easy-to-use adapter panels and plates. Mobile test station solutions also help to further reduce costs by maximizing the use of “off the shelf” parts and components, as well as modular electrical and mechanical interfaces. While the mobile test station and universal test station flexibility and options may appeal to some customers, for others, test-specific stations are what matters most. For example, our team can provide custom functional test fixtures that include specific testing features such as temperature and vibration for Halt/Hass stations, solutions for EMI, RF, EMC compliant test stations, and microcontact to large industrial plant stations. We can also create custom functional test options for video, non-contact, infra-red, laser, and barcode sensor stations, as well as load simulators for active and passive electronic loads. When our customers come to us with unique needs for functional test fixtures and require solutions that are not available through “off the shelf” or “out of the box” solutions, our team of highly trained and experienced engineers and technicians go to work. We listen to the needs of each customer to determine the solutions and course of action that would be best, working alongside them from the design and development phase all the way through to completion. Thermal hoods and plenum interface distribution systems, product and component handle and motion stations, and even integrated electrical, pneumatic, and hydraulic stations can all be customized for test-specific demands. If you are searching for functional test fixtures that will suit your unique needs and requirements, consider partnering with EMC Technologies. We can develop a custom functional test solution that will meet or exceed your expectations. Ask about solutions for mobile test station, universal test station, and test-specific stations or speak with a representative to begin discussions for custom development of functional test fixtures. Give us a call at 508-672-0808 or use our online contact form to get started. We are ITAR Registered and ISO 9001: 2015 Certified and we take pride in providing quality solutions to every client that we serve.